Tropical Storm Isaac is expected to reach hurricane status by Wednesday. CNN is reporting that residents of the Gulf Coast are preparing for the arrival of Tropical Storm Isaac on the anniversary of the arrival of Hurricane Katrina, which decimated the area in 2005. Although Tropical Storm Isaac is supposed to be much calmer than Hurricane Katrina, weather forecasters are projecting that Isaac will reach hurricane strength by Wednesday. Hurricane Katrina was a category 3, killing 1,800 people in the process and causing much of the region to be evacuated and relocated. 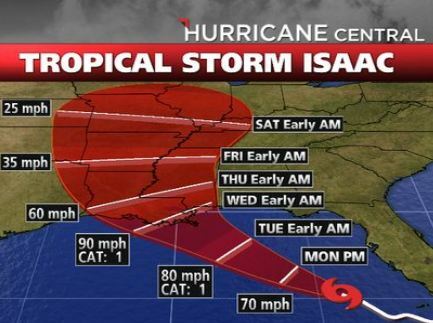 Isaac is projected to be category 1 with top winds nearing 90 mph. New Orleans Mayor Mitch Landrieu is not evacuating the city, but has suggested that approximately 900 people living just outside of the levees leave the area. Tropical Storm Isaac claimed 21 people in the regional area of Port-au-Prince, Haiti and is linked to the death of one person in Puerto Rico. For more information on Tropical Storm Isaac, please visit the National Hurricane Center (NHC). Do you need to know what to do to prepare for a hurricane? Click here. Like TheBurtonWire.com on Facebook. Follow us on Twitter @TheBurtonWire.